This summer David Bennett upgraded his designation as a designer. David attended lectures in Toronto, wrote his exam in June and then submitted his application to the Ontario Association of Architects (OAA) for registration . Ontario is the only province that allows technologists to be directly licensed by their architectural association. David recently received confirmation that he is now a registered member with the OAA. It is with great pleasure for G. Douglas Vallee Limited to congratulate David Bennett on his redesignation, this honour is well deserved. David also reached a personal goal this summer. After 8 years of training in Wado-Ryu Karate Club under The Japan Karate Federation, David has achieved the rank of black belt. John Vallee and Greg Smith from our office attended a Sod Turning Ceremony at Woodway Trails Subdivision along with the developers, local dignitaries, realtors and builders. Woodway Trails is the future site to 1,000 homes. 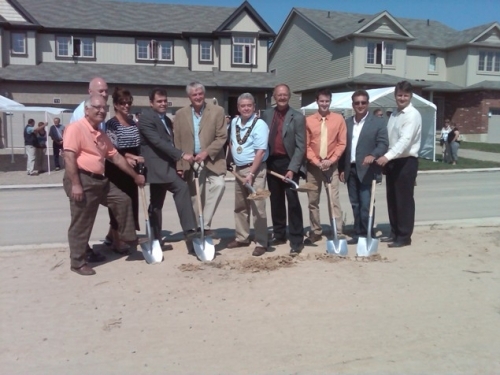 The subdivision will be built over several phases and is the second largest development in Norfolk County. We encourage you to visit one of the seven model homes that are currently on site at Woodway Trails at the south end of Donly Drive. We've had the pleasure of working with the Zitia Group over the last few years on this development. We look forward to working with them over the years to come on the future phases of Woodway Trails Subdivision. Public Information Centres (PIC) for the Porter Bridge and the St. Andrew Street and Silver Crescent Reconstruction project are being held this week at the Port Dover Community Centre. The PIC for the Porter Bridge will be held July 4th, 2011 from 5:30pm until 7:00pm to invite public input and to provide provide information to the public with respect to a preferred solution. On July 6th, 2011 from 5:30pm until 7:00pm a PIC will be held for the St. Andrew Street and Silver Crescent Reconstruction project to invite public input and to provide information to the public with respect to the proposed design, timing and operation. Norfolk County and G. Douglas Vallee staff will be available to answer any questions following the PIC. Public input and comments are welcome, please fill out one of the comments sheets provided. We are proud to introduce our new website, offering public information and a convenient way to learn about our services. Our website allows us to post notices for public projects and will be maintained on a regular basis. Please take the time to look around and feel free to e-mail us any comments or suggestions. Special thanks to James, Dave and the team at Lifeline Design for giving our website a fresh new look and providing us with a site we can easily manage. John Vallee joined the community of Otterville on October 16th, 2010 to celebrate the Grand Opening of the Otterville Fire Hall. The Fire Department, County Officials and Sparky the Fire Dog were there to welcome the community to their new fire hall. We at G. Douglas Vallee Limited are very proud to have been involved in this exciting venture.